The New York steak is a premium cut of beef from the top loin of the short loin, among the most tender and delicious steaks available. New York steaks are known as strip steak, Kansas City steak and club steak, and respond very well to baking in the oven. Verify that your steak is from the top loin of the short loin when ordering New York steak. Baking New York steaks is a straightforward process, although it does involve cooking on the stovetop as well as the oven. Baking the steaks is not a difficult process and is completed by a novice cook without trouble. Remove the 1-½ inch thick steaks from refrigeration and allow them to warm to room temperature, approximately 75 degrees Fahrenheit. Place a cast iron skillet on a stove top burner set on medium-high heat until the steaks are seasoned, approximately 2 to 3 minutes. Massage the New York steaks lightly with olive oil. Sprinkle coarse salt and coarsely ground black pepper on both sides. Place the steaks in the hot skillet for 30 to 45 seconds on one side, turn the steaks over with cooking tongs and sear for 30 to 45 seconds on the other side. Wear oven mitts and use both hands to place the cast iron skillet onto the top rack of the hot oven to bake the New York steaks. Bake the steaks for 2 minutes on each side for rare, 3 minutes on each side for medium and 4 minutes on each side for well-done. Remove the steaks from the oven after baking, cover loosely with aluminum foil and allow them to rest for 2 to 3 minutes. The steaks need the time to finish cooking while the juices flow from the center to the outside of the steaks. 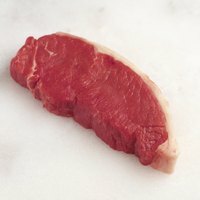 How Long Do I Cook a 1 1/2-Inch New York Strip Steak? What is a Kansas City Steak?